I grew up very much focused on seeing Christian faith as a set of beliefs. I had inherited the Greeks’ love of ideas, so I saw religion as a list of doctrinal bullet points to be affirmed. But as I started to learn about the Bible’s Hebraic context, I wondered what faith would look like if I removed my Greek spectacles and looked at it from another point of view. I discovered an important clue in the first class I ever took on Jesus’ Jewish context. As we began, my thoughts simmered on a stew of elementary questions about Judaism. What exactly did they believe, and how did it compare to Christianity? I wished that someone would spell it all out in a simple statement, a basic creed of some type. Then one day my instructor started handing out copies of the Shema, a profession of faith that pious Jews have recited daily since the first-century. (1) Eagerly, I scanned down the page of what I assumed was their Apostle’s Creed. …I will send rain on your land in its season, both autumn and spring rains, so that you may gather in your grain, new wine, and oil. I will provide grass in the fields for your cattle, and you will eat and be satisfied. How could you get any less spiritual than cows? What on earth were barnyard animals doing in this central profession of faith? I was looking for spiritual truths, heady doctrines like the “communion of saints” and “forgiveness of sins,” not mundane realities like grass, fields and cows. I sat there, stumped at the utter oddness of this choice of Scripture. Sometime later I learned that the Shema isn’t a list of core propositional statements to be affirmed. Rather, it was a daily re-commitment to Israel’s covenant with God. It begins with God’s command to serve only him and then it follows with this passage which recounts God’s promises to provide for their material needs. My approach to faith was very Greek. Like Plato, I saw earthly things as unspiritual, corrupt and worthless. I had gained the Greeks’ dualistic disdain for the material world, and wanted to escape into the world of thought where I could float above, detached, as a cosmic spectator. More importantly, I conceived of faith as mental assent to abstract statements of truth. My thinking was actually quite close to the Gnostics, Greeks who misunderstood the Gospel to say that what was essential to salvation is knowing certain spiritual truths that would unlock the secrets of the heavenlies. The Shema, however, is a recollection of history, a reminder of the oath that established Israel’s relationship with God. It doesn’t list off things to be believed, but it does assume that the speaker believes in the God whom they vow to love and serve. It was a recollection of the promise that the nation of Israel made on Mt. Sinai. The words of the Shema were a binding reminder of the covenant that took place on a smoky desert mountaintop centuries ago. A Creed or a Covenant? Wait, then. Why did I see a list of beliefs as the essence of Christian faith? There actually is a good reason. The core command of the New Testament is to believe in Christ (John 20:31), and the Apostle’s Creed was how the church defined what that meant. In early centuries the church was fraught with division and heresy, forcing it to expend great effort to define core truths. But having our doctrinal ducks in a row is not what saves us. If it was, wouldn’t Satan be fully qualified? What actually accomplishes salvation is Christ’s atoning death for our sins. It’s because of his sacrifice on the cross that we can have peace with God. Christ is actually the one doing the saving, and we are confessing our faith in what he’s done. The Apostle’s Creed does actually remind us of this, but I was missing the point. What would be a more Hebraic way to recollect on our foundational event? Believe it or not, Christians actually do have a way, and Jesus himself gave us the instructions. When Jesus broke bread and shared wine with his disciples on their last evening together, he told them to do this in remembrance of him. They were celebrating Passover, the feast which was a formal celebration of God’s covenantal relationship with Israel. It recounted the night God freed Israel from Egypt, celebrated their current relationship, and reminded them of the promise of the Messiah, God’s final redeemer. On this all important evening, Christ announced that he was bringing God’s redemption by inaugurating the long-awaited “New Covenant” promised in Jeremiah 31. This New Covenant was for the forgiveness of sin, and it would come about through his broken body and shed blood. It’s not a creed but the covenant that Christ enacted through his atoning death that makes it possible for sinners to have a relationship with God. 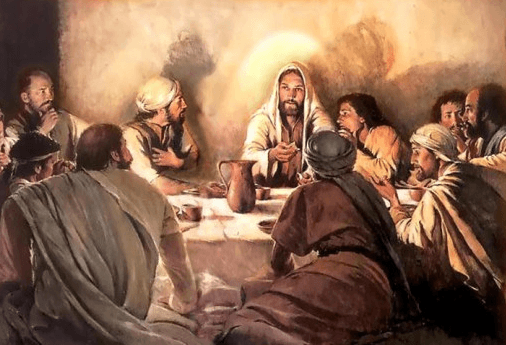 When you think about it, the Lord’s Supper is very Hebraic. It’s not an intellectual discussion, but theology in concrete, physical form. It is a palpable, touchable, tangible way to celebrate our relationship. We are enjoying a meal together, an act that denotes intimate fellowship with God and all others at the table. (2) And we are replaying the moment in history that made possible our relationship with God through Christ. (1) See chapter 2 in my book Walking in the Dust of Rabbi Jesus (Grand Rapids: Zondervan, 2012), pages 31-41, for a lengthy discussion on the Shema. (2) For more on what table fellowship meant in the time of Christ, see Sitting at the Feet of Rabbi Jesus (Grand Rapids: Zondervan, 2009) 128-144. 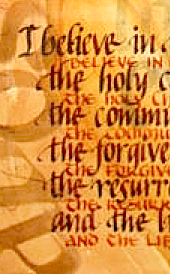 Calligraphy of the Apostle’s Creed by Sonja Van Guilder. Painting of Jesus and disciples by Walter Rane. Always a great ,insightful commentary on things that matter. Putting these items of creeds, covenants, cows, the Shema and the Lord’s Supper in a better perspective to walk out my faith is a constant (albeit fun sometimes) daily challenge. Thank you for the inspiration and insight. I began studying from the Hebraic perspective. It’s interesting to read how you compare and contrast the Hebraic and Greek perspectives. The Shema has been an amazing eye opener for me as well. Father has shown me that it is actually a prophecy as well as a prayer. We preach to ourselves and prophecy it out to the dry bones of Israel as we pray. What an amazing construction of prayer. I think the challenge is to attempt to cut through a barrier of language, time and cultural understanding and seek to arrive at the meaning that was easily grasped by first century Jew and earlier in light of writings and knowledge that are available to us. I suspect the first step is jettisoning the current framework, rather than considering a bit of reforming, tweaking and cosmetic resurfacing is sufficient. Well, yeah, but anything between “but” and “is” that isn’t Jesus is true, too. However, if you don’t have your “doctrinal ducks in a row,” if I understand what this means, how in the world are you going to recognize the sound of the Shepherd’s voice? Seriously, doctrine is just another word for teaching, but lately it’s seems to be used as something meaning “theologic archaica,” “bible geekery” or worse. Teaching what God’s word says and means keeps it living and active and sharper than any double-edged sword in the heart of a believer. St. Paul says as much in Rom 10:14-15. And no, I don’t think Satan knew doctrine, he could just recite some of it and proof text the stuff he was making up. Like a whole lot of other people. Over 25 years ago the Holy Spirit moved me to understand why Cows chew the cud, Rumiate. 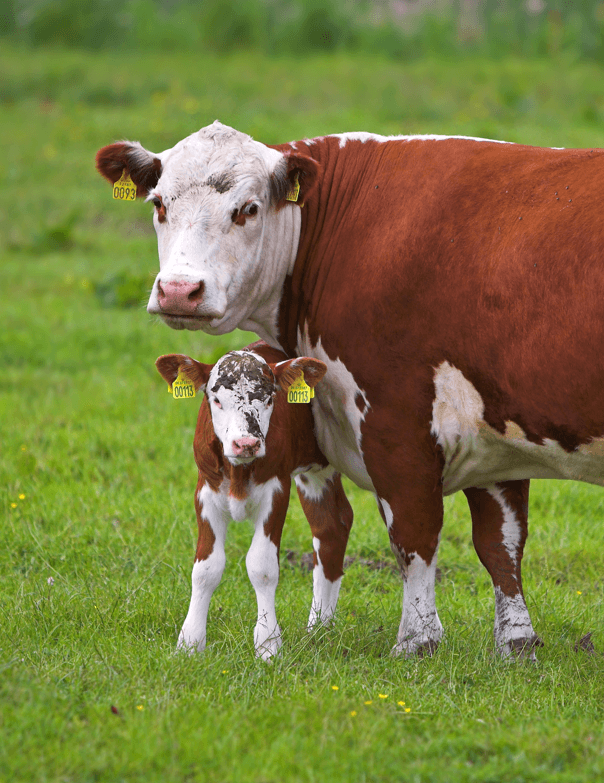 We are to do exactly what cows do, we should during the day eat with our tongue, eat that which sustains us and then at night while resting, bring forth that which is inside us that we have previously consumed. It is the meditation of God’s word and the contemplation of it that brings Rhema revelation to us. Remember where Jesus was placed what he first arrived in the world he was in the manger and he was placed in the spot where cows would eat. 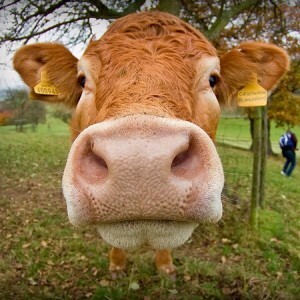 Say moo to your brother. Hallelujah! You are very close to understanding the relationship between the Old Testament(TanaK) and the New Testament(Apostolic Scriptures). After all the writers of the Bible were Jews, except for Luke, and they wrote with a Hebraic understanding. Would love for you to get in touch with Tim Hegg at Torah Rescource Institute. He might help you to understand a lot more! Karl, I bet Satan could trounce both you and me in a doctrinal debate. I’m not saying that beliefs are unnecessary, but that they are not sufficient. I’m guessing that’s what you mean too. The New Covenant is what makes salvation possible. I agree that doctrine in the sense of “teaching” is great. And clarifying what we believe is important too, mainly because having mixed up ideas erodes a person’s faith in Christ. But it’s still Christ that does the saving, not the blob of flesh between your ears. I actually wrote an article about what kind of “belief” is required – check it out. What a great article Lois. Again, thank you for your books, your writings, and the way you’re helping us truly renew our minds! This is simple, accurate and enjoyable article. Here in Israel we understand well that the year we don’t have much rain is the year that Our God has not blessed us. When the only source of our water supply is threatened we start thinking a way from our hi-tech life we lead to the physical matters of grass and cows rather quickly. Here the connection feels more immediate. By the way, I publish a blog called Jewish Studies for Christians where I approach matters in a similar way. Excellent! Thanks Lois. Almost missed this post in December. So thankful to have read it today.